One of the biggest values you get from traveling the world is interacting with different cultures. I’ll admit that technology has made it a lot easier to learn, and having video calls with people halfway around the world is impressive, but it’s not perfect. When you first step outside your country, you immediately see the varying ways of life and cultures. Why is this important? Let’s think of cultures like computer languages for a second. Variance in computer languages allow us to view problems from slightly different perspectives. We have certain variables that make up this culture. We have certain norms, certain policies, certain liberties, and certain restrictions. Visiting countries with entirely different cultures introduces us to new meanings for these variables and the ability to see problems slightly differently. We gain a new set of eyes. Most people I meet have lived in the same city for 20+ years. When you start living in a new city you explore the hell out of it, but after a few months we just get comfortable with the same routes. We become complacent with our surroundings. One thing I’ve learned as a photographer is seeing things with fresh eyes. What’s this ‘fresh eyes’ business? Take for instance the route you take to your local coffee shop. You might make that walk once a day - but it’s likely you don’t look around too often on your walk. Experiencing your city as though you’re exploring it for the first time is a humbling experience, and really makes you appreciate wherever you live. Traveling gives you a sense of scale, importance, and magnitude. It’s hard to quantify a world’s worldliness in books and on screens. Many have tried, and failed. The people you meet, the stories you hear, and the places you experience, all exist as things you can’t understanding till you’re standing in the middle of them. In a cross-country road trip across the US last summer, I remember we pulled off to the side of the road and got out. We just stood there, in the middle of Nevada. No technology can yet quantify that emptiness, that middle-of-nowhere-ness. I believe there are adjectives in the English language that can’t be understood till you experience them first hand. Till you’re knee deep in them. When we visit other countries and experience vastly different ways of life, we begin to understand the world, from a truly worldly perspective. One project I would tackle if I had a year to do anything: I’d start a project that aims to document and share the wisdom of older generations. Specifically those who are 60+ years old. Why? My generation doesn’t seek the wisdom of those older than us often enough. We have huge wells of knowledge that people my age don’t attempt to ask about, at all. Gathering and documenting these small pieces of knowledge from around the world would mean their experience and understanding of the world could live on, and be accessible throughout the world. 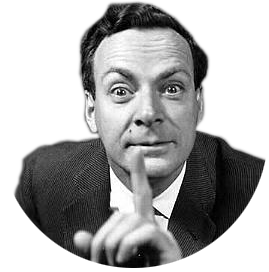 Richard Feynman (pictured below) is well known for describing the differences in how an individuals thought process occurs. For example, you and I use different imagery to describe the same thought or idea. Much of the work of a teacher then become the translation of thoughts and concepts. With the understanding that each of us needs a slightly different and unique translation of a concept, we become better translators. The more practiced we become as translators, the easier and more accessible our ideas become to others. This simple understanding goes for both the teacher and the student and will ultimately help us when taking on something new. What does it mean to master a concept? Let’s look at this through the lens of teaching. You have to teach the person across from you a concept. They are totally new to said concept. Mastery in the context of teaching is really the ability to break down obscure principles that make up the greater concept. The principles need to be understood by the teacher at an extremely deep and rudimentary level. This includes the ability to dig beneath even the basics and understand the mechanics of how each of the variables that make up different principles rely on each other. This thoroughness and deep level of understanding of a concept is what defines mastery.